This year I'd like to share this delicious family treasure again within my series of Advent Calendar of Christmas Memories articles, giving a little more attention to our family's special legacy with regard to this delicious traditional favorite. This is the first Christmas that our family will celebrate without a very special family member, my dear Aunt Barbara. She passed away last January. It has been almost a year now, yet the passing of the first Christmas without a loved one is probably one of the most difficult milestones when grieving a loss. So it is with dear Barbara, for myself and the rest of the family, but particularly for her children and grandchildren, I'm sure. One of 100 Years in America's most faithful readers, one of Barbara's daughters, faithfully bakes these family Christmas cakes each year (and provided me with the beautiful photograph above). One of the sad moments she experienced this month was not being able to call her Mom and say, "Guess what I'm making?" My cousin was taught by her mother, Barbara, who was taught by her mother, our dear grandmother Mitzi. A young bride at age 18, Mitzi had gone to live with her new husband in the household of his mother (and many siblings) several states away from her home. 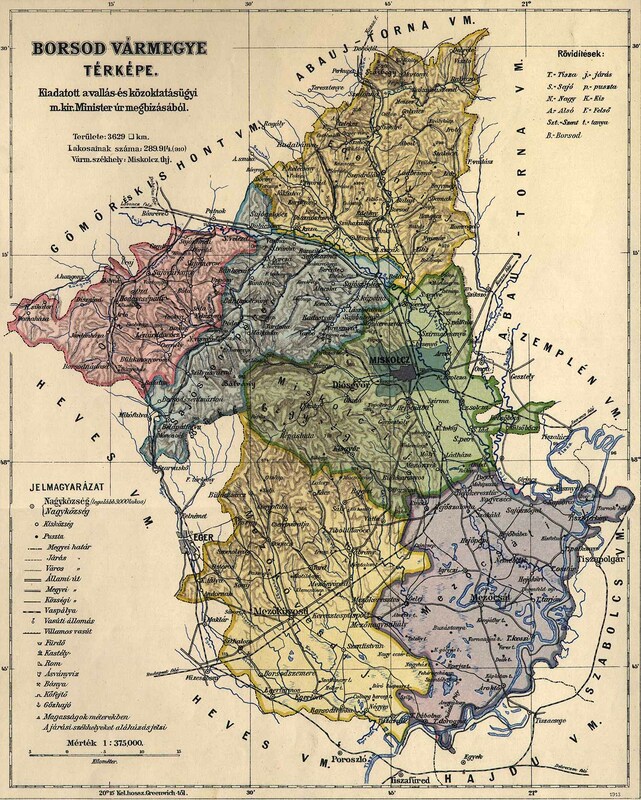 There she was trained to cook and bake as her mother-in-law did, using her recipes from northeastern Hungary. 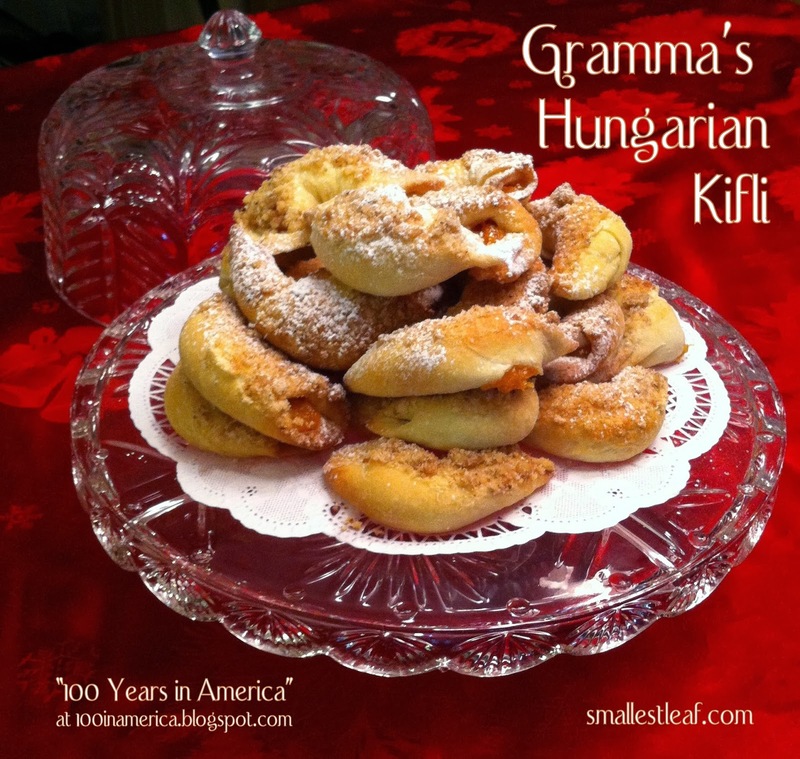 One of the recipes Mitzi mastered: Hungarian Kifli. 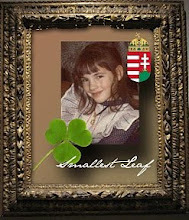 Mitzi's mother-in-law, Maria (Németh) Tóth (known as Mary in America), was a 34-year-old mother of four when she emigrated from Hungary's Borsod county to join her husband. Along with transporting four children (one a baby!) on that journey, Maria carried with her a wealth of Hungarian family recipes that would be treasured by many generations of our family over the next century (and hopefully more!). 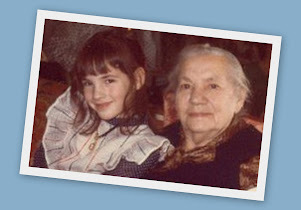 I like to imagine Maria as a young girl within her mother's kitchen, learning to cook the Hungarian Gulyás (goulash), Töltött káposzta (stuffed cabbage), Csirke paprikás (chicken paprika), and Kifli that would become our family's favorites. Maria and her mother could not possibly have imagined that a century later and a world away, their descendants would remember them and their recipes fondly, having received the legacy of nourishing love produced by the hands of their daughters, daughters-in-law, and grand-daughters. As I once again share this Kifli recipe, I do so in honor of these women who came before us: my dear Aunt Barbara, my grandmother Mitzi, my great-grandmother Mary (Maria), and her mother (another Barbara): Borbála* (Nagy) Németh. Otherwise known as "Gramma's Christmas Cakes"
Kifli may also be served with a prune filling (prepared similarly to the apricot filling) or a walnut filling, although the apricot kind has always been the favorite in my family. If using walnut filling, add boiled milk to the nuts until pasty, then grated lemon rind. 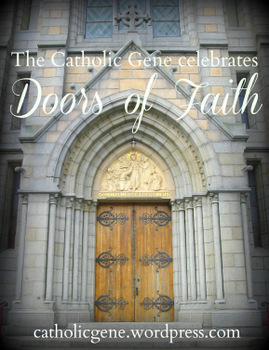 This article is part of a series written in celebration of the Advent and Christmas seasons. It will be included as part of the Advent Calendar of Christmas Memories 2013, Day 4: Christmas Recipes. For more Advent and Christmas memories here at 100 Years in America (going back to 2007), scroll through these articles or stop by my Pinterest page. Visit this preview for more details about the GeneaBloggers Advent Calendar of Christmas Memories and to get some inspiration to get yourself in the holiday spirit! Note: Our family's Kifli recipe has also appeared previously as part of the Advent Calendar of Christmas Memories here at 100 Years in America several times (once in 2007 and then twice in 2009 - here and here). Over the past six years, these have continued to be among the most frequently viewed articles here at 100 Years in America. If you took the time to try out our family Kifli recipe, please leave a comment and let us know! What a lovely article. My grandmother also came here from Hungary and made these kiflis! I don"t have her recipe, but I know that yours is close because of the sour cream and apricot jelly. Her little personal twist was a touch of nutmeg in the dough and a touch of strawberry jam mixed into the apricot. Per 1 cup of apricot jelly she would add about 1/4 cup strawberry. Anyway, thanks for sharing your memories and recipes! Thanks very much for your comment, Dianne. Your grandmother's additions of nutmeg and strawberry jam sound delicious!